Been more aware of various kinds of fakery in my life and around me recently, and they are starting to grate increasingly. This can only be a good thing. One sad thing about having chosen to live in Coventry is that it is major far from the sea; in fact, it’s just about as far from the sea as you can get in the entire United Kingdom. No waves, no sand, no cliffs, no fish. I’m not the most outdoorsy person, but the sea is somehow important. Growing up in Singapore, it was always just there. Beachfront cycle ride or weekend barbecue, just jump in the car and go. Chilli crab and really fresh steamed fish were all par for the course. It wasn’t until I moved to Coventry and had been here a couple years that I felt like something was missing. It wasn’t a crisis of purpose, because work was super exciting, and I was growing a lot personally, but just a vague, nagging sense of being stuck going down a very long, continuous road. Which I suppose makes sense if you realise that Coventry is right in the middle of the UK landmass and to get anywhere, you do in fact have you travel for a good few hours down a very long, continuous road. It made me realise that even though I am mostly a city girl (and in fact when it comes to cities the bigger the better), I have been raised with an inbuilt need for space that pops up from time to time. In waves, you might say. We hiked up the cliffs to get better views of the landscape and the surfer action. 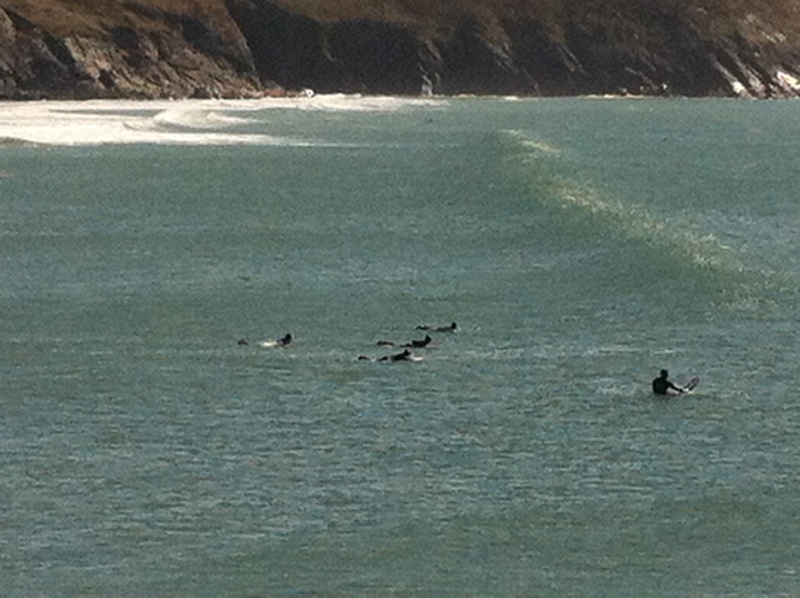 I loved watching the surfers; they reminded me of a lot about waiting. I’ve never surfed before, but it looked like you have to be really alert, constantly on the lookout for the next good wave, and then when you see one you paddle to catch it. None of this hanging around and doing nothing business that surfers seem to be known for! And then you might not get on your board at quite the right moment, or you might lose your balance, so it’s a bit of a risk — but it might all work, and you keep trying because when you do, when you ride a wave, it’s the best feeling in the world. Phone photos don’t do it justice, but this was a pretty much perfect day.